Valerie Still was born May 14, 1961 in Camden. She was the ninth of 10 children raised primarily by her mother, Gwendolyn. Four of Valerie’s brothers went on to play college sports, including Art, who was an All-Pro center with the NFL’s Kansas City Chiefs. Valerie was arguably the most talented of the Stills—not just in sports but academically and musically. She played the piano, saxophone, trumpet and guitar. Valerie grew to 6’1” and was a first-rate scorer and rebounder. After a stellar career at Cherry Hill High School East, she followed Art to the University of Kentucky in 1979. The Lady Kats, coached by Debbie Yow her first year and Terry Hall the rest of the way, became an NCAA powerhouse during Valerie’s four varsity seasons, averaging 24 wins a year and losing a grand total of 24 games. Valerie scored 22 points a game as a freshman. As a junior she led Kentucky to the SEC title and the Elite Eight of the NCAA Tournament. As a senior in 1982–83, she teamed with Lea Wise and Patty Jo Hedges to boost the Lady Kats to a #4 national ranking. Valerie was First-Team All-American that year. When she graduated, she had scored 2,763 points—by far the women’s record and also eclipsing Dan Issel’s men’s record—and averaged well over 20 a game. She also set a school record with 1,525 rebounds. Valerie also set new standards for pionts (42) and rebounds (27) in a game. At the time, no pro hoops league existed for women in the U.S., so she went to Italy and became an eight-time All-Star and won several scoring titles. Unlike some other Americans, Valerie embraced the foreign culture. She sang and played guitar in night clubs, recorded CDs and even hosted her own TV show—where she met her future husband, Rob Lock, a Sixth Man for the Kentucky teams of the late 1980s. He played in Italy for eight seasons and briefly in the NBA, for the Clippers, before opening a flying school. Most off-season, Valerie stayed in Italy, broadcasting, sportwriting and modeling. 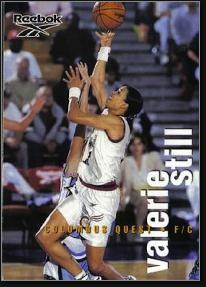 In 1996, Valerie joined the Columbus Quest of the newly formed American Basketball League. As an undersized, mid-30s center, she led the Quest to two league championships—earning MVP honors in both finals. In the best-of-five 1998 final against the Long Beach StingRays, the Quest fell behind 2 games to 0. Valerie played lockdown defense against Yolanda Griffith and Venus Lacy to get the series even, then scored 25 points in Game 5 and sealed the deal with a steal in the final seconds.In 1998, she was nominated by the Women’s Sports Foundation for Sportswoman of the Year. After the ABL folded, Valerie played one final season of pro ball for the Washington Mystics of the WNBA.She also coached briefly in the WNBA. Rob and Valerie produced a son, Aaron, in 1996, whom Valerie raised as a single parent after they split up in 2005. She earned a Masters in African American Studies and a PhD. in Sports hHumanities, wrote books for kids, and ran the Valerie Still Foundation, a charity she founded in 1999 to encourage young women to fulfill their potential. She also coached high school basketball, including her son’s team in Lawrence, Kansas. Valerie’s family traces its history back four centuries, and her ancestors played a key role in the Underground Railroad. She wrote about these experiences in the 2012 book Still Alive on the Underground Railroad.